I’ll admit I was a little skeptical of Ru when I first read the excerpt on the back cover: references to the Tet Offensive, the blood of soldiers, and lost lives signaled a tragic and depressing story, and I wasn’t up for it. However, this first novel by Kim Thuy won the Governor General’s Literary Award in 2010, among many other awards both local and international, so I put first impressions aside and followed the advice I’ve given many times never to judge a book by its cover. What a relief to find a literary tour de force, so powerful in its prose that each vignette flows seamlessly into the next, leaving you eager for more. This remarkable fluidity is echoed in the title, Ru, which means lullaby in Vietnamese and small stream in French. Originally composed in French and translated into 15 other languages, this novel is set in Saigon during the Vietnam War, a refugee camp in Malaysia, and the promised land of Quebec. It loosely follows Thuy’s own experience as a survivor and immigrant. The structure is atypical for a novel; most of the chapters are only one or two pages, each focusing on a different memory. In some ways it reads like a long poem, each word chosen carefully for its distinct meaning, vibrance, and delicacy. In other ways these chapters are like short, cinematic scenes. Each one is a new lesson, a new insight into the subtleties of human nature, based on the wisdom of someone who has witnessed the disappearance of everything familiar and safe. Amidst stories of loss and hardships are tales of hope, unexpected generosities and love. There is a reverence for the people of Quebec who welcome main character An Tinh with open arms, and there are reflections on an animated past full of tradition in Saigon. There are darker moments highlighted by the arrival of the Communist soldiers, the poverty that leads to personal and physical sacrifice, and the lives wasted in the carelessness of war. Ru is a quick read, too short in my opinion. I find Thuy’s powers of description addictive, and will certainly give this book a second and third read. 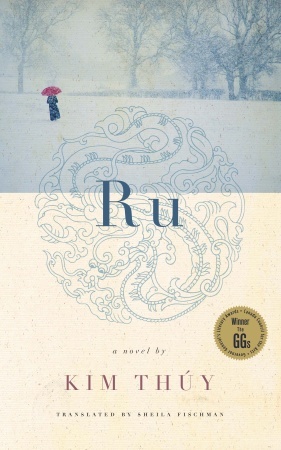 The novel has left an indelible impression on me; I will not remember the details, but I will remember Ru fondly as a novel that brought me pure joy. Click here for an interview with Kim Thuy where she talks about her experience in writing this novel.